Over the course of the SEMA week, thousands of new automotive parts and accessories have been officially launched to the industry. 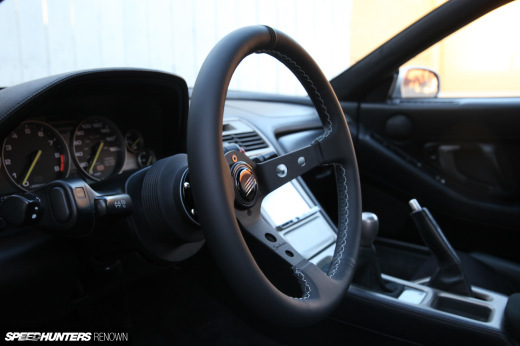 One, however, is very close to our hearts: the Renown x Speedhunters 100 Steering Wheel. In late September last year, I received an email in the middle of the night from a mysterious person. They explained they were from Speedhunters in Stockholm, had been following Renown and loved what we were doing, and that I should check out the Speedhunters website if I had never heard about them. My first two thoughts after reading this email was, 1) This is not real, and 2) I am still dreaming? I have been a regular visitor to Speedhunters since it started and it’s my favorite way to follow all the incredible machines and events from around the world. To be contacted and receive praise from your hero can be a bit overwhelming, but I quickly realized this was real and that a huge opportunity to collaborate was forthcoming. Let me back up and tell you about myself and Renown USA. 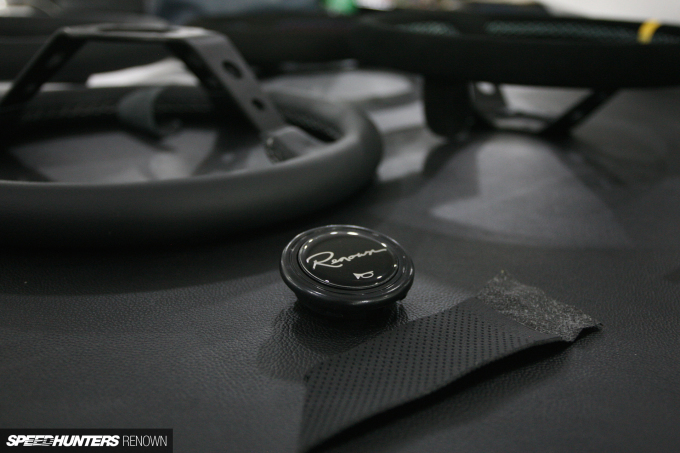 I started Renown in San Francisco at the end of 2014, because I couldn’t find the parts I wanted for my cars. I believed there was a niche not being served in the interior of aging classics from the ’70s, ’80s and ’90s. Being a collector of the simple, timeless machines of this magical era of sports cars, I knew first-hand that some of the most wear happens from the driver’s seat. I’ve always been fascinated with steering wheels, and for many of the cars we all love, the original equipment is mundane and aesthetically displeasing. Furthermore, it’s definitely not the best choice for spirited driving or driving hard. There was an existing aftermarket offering but it felt generic, outdated and lacking in variety. Instead of a one-size-fits-all approach, I wanted to offer enthusiasts a small number of styles in variations that would match their car perfectly. So my goal was simple: create a brand that would offer products that feel like they belong in the car, have proper aesthetics without begging for attention, and maximize the driving experience. Thus, Renown was born. We strive ourselves on offering a product that is unparalleled. We spend countless hours in our machines enjoying all the intricacies they have to offer, and that all begins at your fingertips, in your hands, at the steering wheel. 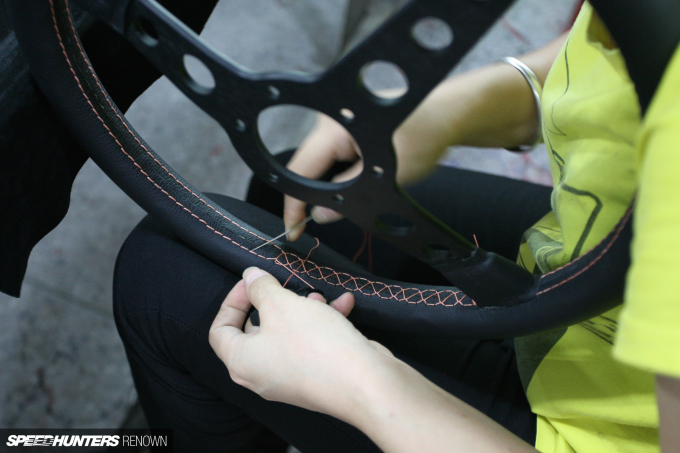 Here are some pictures to give you an idea of how our steering wheels are made. We are constantly evolving our methods and materials to make the products better, stronger, more durable and wear nicely to feel even better the more you use it. We take great pride in offering a personalized experience with everyone who decides to join the Renown family. To give you a bit of history of my journey with cars, I’ve loved them my whole life. As a kid, my uncle had an E30 M3, and from the first time sitting in it I was mesmerized. 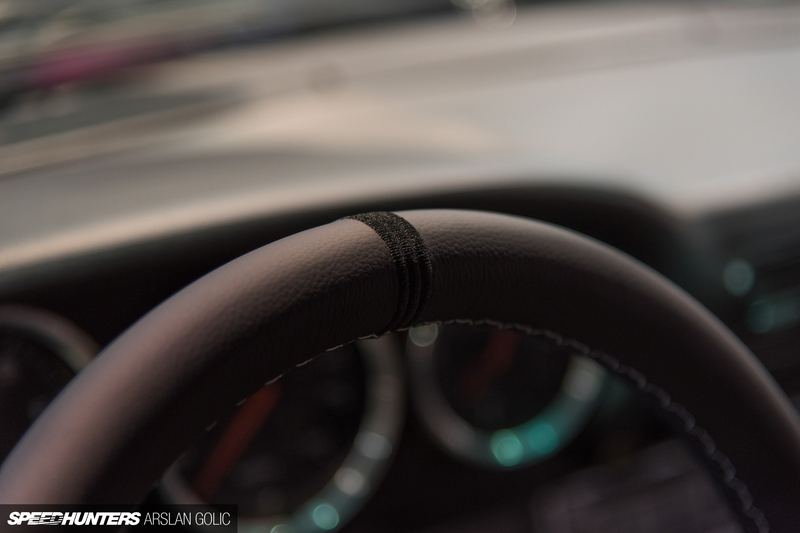 Everything about it was so driver-centric, the dash being angled towards the driver, all of the controls being easy to reach and in the right place, the instantaneous response and the flatness it maintained in the corners. Also, it was very spartan, with just the essentials; everything black. It felt like nothing I had ever been in. My first car was my father’s cherished, hand-me-down ’87 Supra in metallic brown. While not great in Wisconsin winters, it was still a great GT car nonetheless. To this day, I think the noise of an inline-six is hard to beat. After that I found a clean, one owner, dark gray metallic Nissan S13 240SX, and then one of my dream cars, a Mk2 VW Golf GTI. I’ve had a dozen Mk2s since, and still have one I love blasting around San Francisco. As I finished college, I got my first E30 and have always kept a few close by ever since. Since moving to California, I’ve been blessed with being caretaker of many special machines, ranging from my ’90s WRC dream car, the GC8 Subaru STI V5, to a few screaming Honda S2000s, and many other old and special BMWs. But enough about me. After meeting the Speedhunters guys at SEMA 2015, it was clear that we shared the same vision. 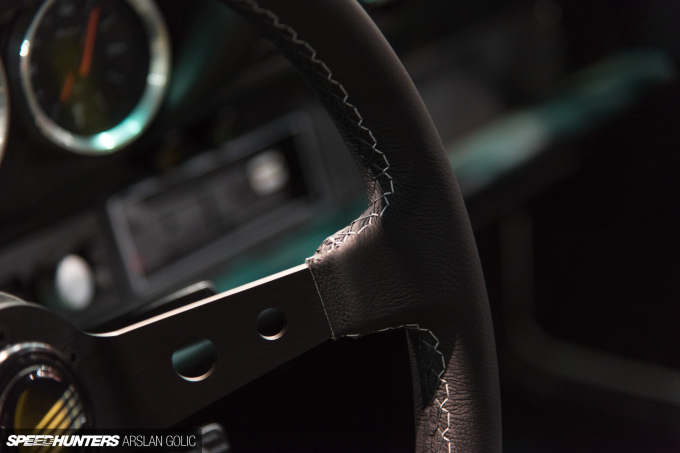 The best way to give back to the community together would be to develop a unique Renown steering wheel, exclusively for Speedhunters. We quickly got to work in 2016 with concepts, ideas and special elements we wanted to incorporate. 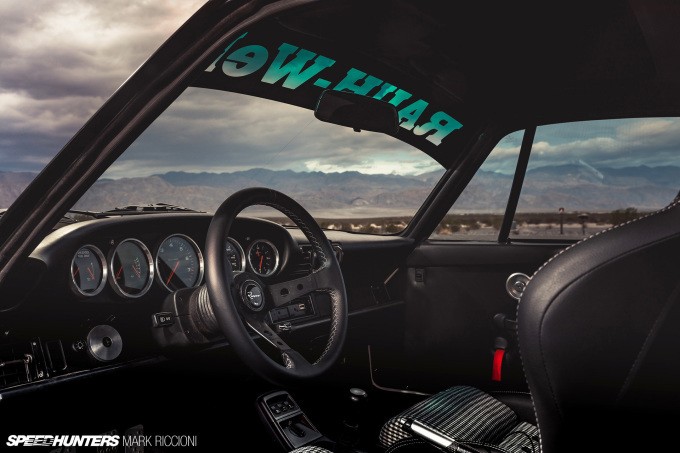 One of these elements is combining both the famous Speedhunters logo with the Renown script. Many people ask where the Renown script came from; it is simply my handwriting on a good day. So instead of having too many things on the face of the wheel, which goes against our philosophy of simplicity and discreet elegance, we collectively decided that I would create a Speedhunters script which is engraved on the center spoke of the wheel. Another special feature is the centerline. Not wanting to be redundant with anything else on the market or attract any attention with traditional bright colors, we’ve gone with a sleek centerline in black. 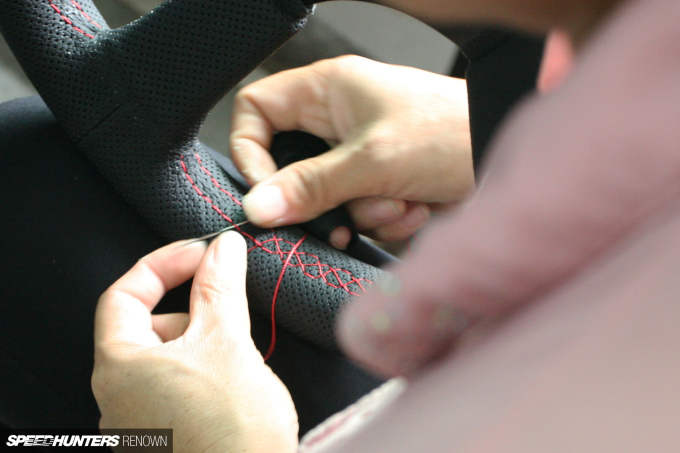 So that it’s still noticeable for the driver, we chose triple-line embroidery at the 12 o’clock position. For the stitch colors, we opted for a Renown specialty of using three different colors to create a tricolor weave stitching pattern. An overlying concept for the wheel was to incorporate both our environments of San Francisco and the Speedhunters headquarters in Stockholm, Sweden. So the stitching is silver, gray and black reflecting silver clouds, fog and dark skies. To ensure exclusivity, we have limited the number to 100 numbered steering wheels in 100mm depth, 350mm diameter, all in genuine leather. Creating a new wheel with so many unique design cues takes time, so it has been a goal to show the world our new wheel at SEMA 2016 in Las Vegas. 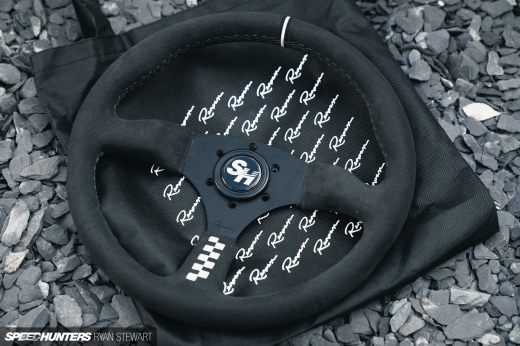 As mentioned earlier, the Renown x Speedhunters 100 Steering Wheel will go on sale at the end of November, so keep an eye out here for the exact release date. In the meantime, you can keep up to date with my Speedhunting adventures via Renown’s Instagram; I look forward to sharing more stories of the amazing people and machines of San Francisco, California, and all across the world with you. 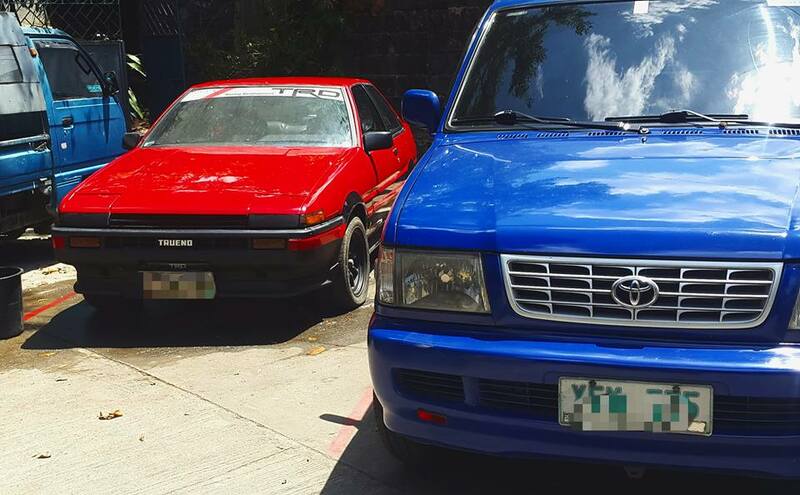 My heart skipped a beat when you said your first car was an '87 supra, as I have one myself. There's a few big names in the custom wheel business that I'm familiar with, but even after a quick look at Renown's selection, I can tell there's real quality in those products. Picked up a Renown recently and love it. Definitely a wheel I want to keep for years to come no matter the vehicle it ends up in! Can you tease us with a price range? I owned a Renown wheel before and the auality is top notch. Probably the part i like the most, ia the rim of the wheel was thicker than most other similar steering wheels. I may have to pick up another one soon. Please make a 300mm diameter option! props for doing his thang, but these just seem like upgraded NRG wheels. Hyped in the e30 scene, now coming up in the world. the dude, does have nice taste tho. Love his e30's. I would try to buy one....but the cold hard truth is, it will be sold out ten minutes after going on sale. Awesome guys, I want one. What is the thickness of the grip on the wheel? I have big meaty hands! I know that "everything is a copy of a copy" these days, but can Scott (or others) chime in on how these wheels look virtually identical to MOMO/NARDI offerings? 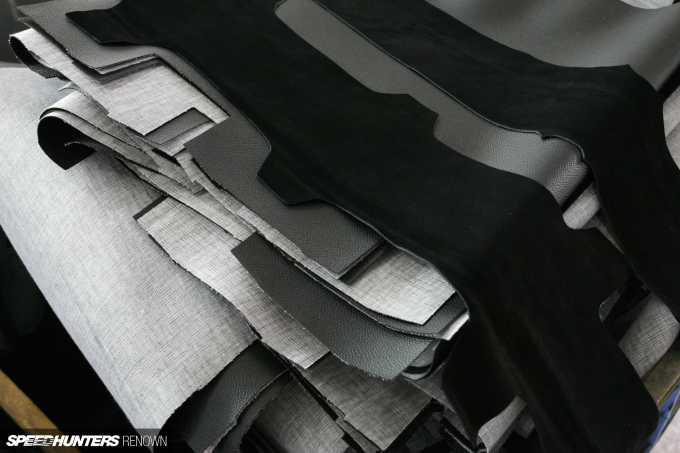 1) The Renown "Monaco" looks identical to the MOMO Prototipo, save for the stitching/color options. But it that all that differentiates it from the MOMO? I would be ok with a simple "Renown wheels draw on inspiration from timeless classics"...but I guess that's just the climate we live in nowadays! 3) Where are Renown wheels made? 4) Does Renown USA have any relation to the "Renown" seen on the Mazda 787 race cars? Gasosphere LukeEVOVIII YES - we certainly do make wheels that are not 100mm deep. I personally use the 50mm depth model which we call the 130R named after the famous no-lift left hander at Suzuka. This depth is just a little closer than OEM on most applications. The flattest wheels we make are 30mm, which are essentially the same as OEM spacing without a quick release etc. Check out all we have to offer here: http://www.renownusa.com/category/steering-wheels Thanks! Stucky Thanks Stucky - appreciate your support! BSides The price range for the Renown x Speedhunters wheel will be in the $250-$300 range, easily within reach for everyone. Thanks! Gasosphere Much appreciated! We have wheels with thicker grips (130R, Clubsport, 100) as well as thinner grips for extended track use with gloves (Mille, Monaco). DevBizkit We look forward to you joining the Renown Family. Chris Nuggets Do you drive a gokart? Haha. We recently launched 330mm models called the Clubsport and Mille, but have no plans to make a smaller wheel than that. Anything smaller and you won't be able to see your gauge cluster at all! Lotus Elise or Exige - even the stock wheel is only 315mm, so most people use 300mm wheels. earmenau Put two side by side and I promise you'll be blown away. Do it! I-See-Hondas Stay tuned for updates and make sure you are ready to order when it launches! Good luck! dangina ~36mm! This is perfect for you! SeanW1 You can't reinvent the wheel - and we have taken inspiration from our favorite motorsport wheels that are timeless just like you said. We use the highest grade materials and offer options so that they fit into any application like they were always meant to be there. There are lots of subtle differences like stitch pattern, thickness, finish, feel etc - but you don't have to take my word for it, try them all and see for yourself! The Lemans winning Rotaries are one of my favorite race cars, so lots of inspiration but no affiliation. Manufacturing is Secret. Cheers. Chris Nuggets ScottRenown Lucky - what a wonderful car! ScottRenown SeanW1 Thank you Scott! I was just curious if the wheels were made in Asia or the USA, but I can respect trade secrets! 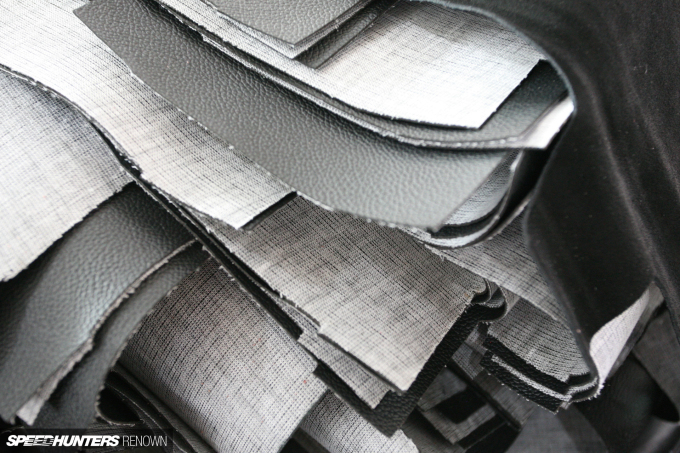 In your opinion, how does the grip of the Monaco compare to the Prototipo with respect to softness/diameter in full leather? Would have been nice knowing this wheel would be displayed before SEMA. That way I would have paid special attention to it. 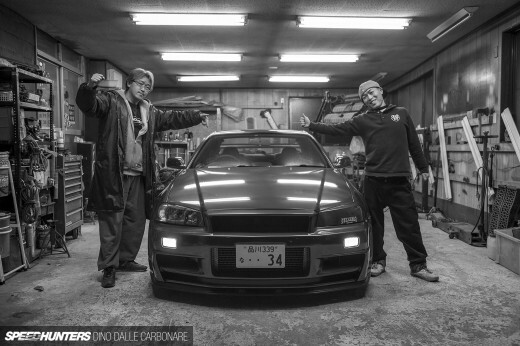 will it be out on Speedhunter or Renown's webbie? Kuen BOTH! Thanks for asking. matsleight We are sorry but we have had a slight delay in the process because QC. Not but a perfect design is good enough for us. arslangolic Can you give us any information when this one hit the market? as Jeff said I'm surprised that anyone can make $9248 in four weeks on the computer .